Today Teen Twin2 came home with the momentous news that she has been selected to attend a meeting with a V.I.P visitor to The Academy. She has been selected specifically because The Academy thinks she shows an aptitude to go on to study law or politics which came as a bit of a shock to both of us to be honest. Her knowledge of the law is limited to what a 16 year old is legally able to do ... buy a lottery ticket, drive a tractor, get a tattoo with parental consent etc. As for politics? Well, she thinks David Cameron and Gordon Brown have nice smiles, Ed Milliband looks like Wallace (of Gromit fame) and I'm not sure she knows who Nick Clegg is. So if you're looking for quick political insight, I really wouldn't consider asking Teen Twin2 first. Nevertheless a special invitation is a special invitation and to be one of only 20 or so pupils chosen to meet with the V.I.P made me proud even if it left her completely non-plussed. "Who is this V.I.P?" I asked. "Er, dunno," she said, "Baroness Somebody, er Varsey." 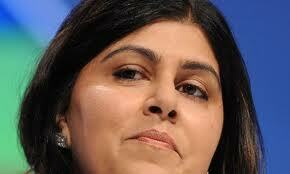 "Warsi," I hooted excitedly, "Baroness Warsi." Teen Twin2 and her carefully selected Year 11 and 10 cohorts have been asked to prepare a question to ask Baroness Warsi in advance which will be submitted to "her people" and approved before anyone is allowed to ask anything at all. I WAS reaching for my pen when she then told me that the questions they submitted were "not allowed" to mention the cost of a University education or where the Conservatives are failing or even make suggestions where they might do better. "Basically," said Teen Twin2, "We're not allowed to talk about politics at all." Despite my own personal devastating disappointment, I am troubled about what this meeting with a V.I.P is supposed to achieve. So pupils are given the opportunity to meet a strong and powerful figure in the political world, but The Academy or/and Baroness Warsi and "her people" will not allow them to embark on any kind of political debate with her. At all. So what. Anyway, Teen Twin2 remains resolutely unmoved by the entire procedure and still has to submit a non-political, non-controversial, basically non question tomorrow morning. She'd like me to think of one because, well, she can't be bothered and really I can't blame her. Presumably asking why she went into politics is er, political.